As far as I'm concerned, this is all WOW factor. Elaine, i didnt vote on this challenge so i just now saw you photo. its great, congrats. you should enter it in the club contest. Oh, this is lovely! 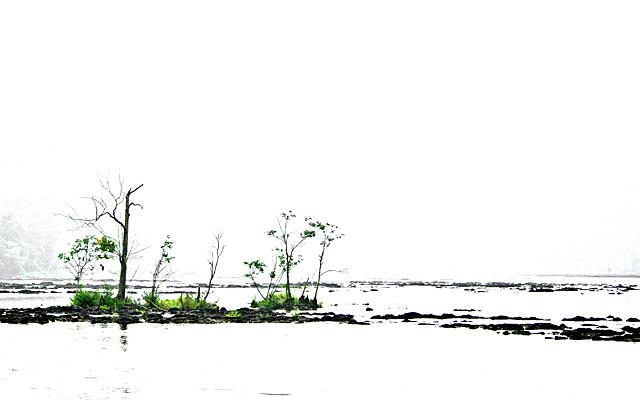 Wonderful use of overexposure to create a minimalistic and compelling landscape. Very nice! Beautifully stark and minimalist, and that pop of green is nicely complementary. This is lovely. I like the touch of strong green in all that whiteness. The composition is beautifully balanced. Good simple picture. Perhaps take a bit off the top? I really enjoy the colors in this one, nice to see some green in there. Having the dark horizontal lines look so much like a drawing or painting sets off the remaining greens and branches on the small island. Well done. A stark, minimalistic photo, the dead/dying trees add to this feeling. Don't care for the pp - grass is too green to fit in witht he mood of the rest of the shot, imo. Proudly hosted by Sargasso Networks. Current Server Time: 04/26/2019 01:42:18 AM EDT.